Undoubtedly, this has been the best day in this year's Canada Reads debates so far. And not just because Deafening was eliminated- though that was a plus. Today, everyone seemed more energized and vocal- even Nelofer had a good point or two. Though I did feel like screaming at Nelofer when she revealed she had voted against Rooms For Rent again. It wasn't surprising at all, but her logic is just plain goofy. Basically she argued that it wasn't something Canadians could learn about themselves through, it didn't have the history lesson that Three Day Road had. Please. Rooms For Rent has Canadiana coming out its whazoo. It certainly has more than A Complicated Kindness. But Nelofer did shine (or so I thought) when she defended Three Day Road against those who (predictably) argued that the characters were too stereotyped. I found those charges a little ridiculous and hypocritical. Musgrave I believe it was (it's hard to tell over the radio) agreed with the stereotype comments and said they were too serious when all the native people she knows have "the best" sense of humour. Three Day Road revolved around three Cree characters. Just three. You know what? I've met plenty of native people who had absolutely no sense of humour. So the fact that's there's three in this book who are a little on the serious side, is entirely plausible. It's almost as if Musgrave was arguing that it's okay to stereotype as long as it's a good stereotype. And as for any negative stereotypes (specifically, the "scalping" seemed to be an issue) some people DO FIT STEREOTYPES! Like Thompson said, it was brave of Boyden to not shy away from something just because it may not be politically correct. I hate to have it said that an author couldn't write a "stupid Newfoundlander" into a book just because someone might be offended. Some of us are stupid. Not all, but some. All the politically correct laws in the world can't change reality. Finally they discussed A Complicated Kindness. Twenty-five minutes into the show and I thought they were going to overlook it again! But then they did and I'm convinced it'll be in the final two. Samson's defending it, Thompson and Musgrave seemed to think it was funny (it did have its moments) and even McTeer who tried to out it earlier had nice things to say. I hope I don't sound like a broken record- but it was not THAT good. It was just okay. But as long as Deafening doesn't win, I'm content with whatever takes it. And with another tie, the deciding vote will go to McTeer who'll vote off Three Day Road. I was convinced before this contest started that Three Day Road would walk away with it, but after listening to today's discussion I'm no longer convinced. Though looking at the Canada Reads "Answer This" poll on their website, the majority of its listeners will be disappointed. My favourite is easy. Since it is one of my favourite books ever, it is Johnston's Colony of Unrequieted Dreams. However, I haven't read enough of the others to pick a least favourite. And Musgrave's attack of the steotypes while saying native people are the funniest people she knows, was hilariously ironic. I'm rooting for Toews' book but I haven't read the others. 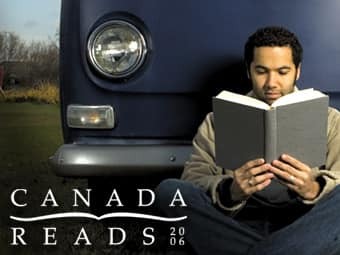 (I love Canada Reads every year but am such a slackass about reading the books. I haven't even read Rockbound yet.) I miss it being on TV like last year. It was fun to watch the action and less confusing trying to figure out who was speaking. Great recaps, btw. I look forward to them. I'm not sure why it wasn't televised this year. I too preferred that. Maybe a ratings thing? I guess I'd have to say Colony was my favorite too... but it's a bit of a toss-up. I very mucy enjoyed Richler's Barney's Version and Atwoods's The Handmaid's Tale as well. Here's a different question for you: What book would you like to see on the program for debate that hasn't yet shown up? RJ, I've often thought about what book I'd defend on Canada Reads and I keep coming back to Alistair MacLeod's No Great Mischief. Though, judging by this year's panelists I doubt it would do that great. Good as it is, there's not a lot of humour in it. How about you? I didn't even realised they were televised previously; I've always just listened to them on the radio. I know John Samson does not like tv, but I don't know if that was a factor. I'd love to see a Douglas Coupland novel on the list, probably Generation X.